Synchronized blogging! It's The Session. This month's topic is beer festivals, so I feel obliged to write something about the Oregon Brewers Festival. The 2008 festival is July 24-July 27 -- it's always the last weekend in July, a highlight of the Portland beer calendar. What I have to say is probably old hat for locals, but I wanted to take advantage of The Session to introduce the OBF and Portland to out-of-towners. Light and easy-drinking: for warm weather and neophytes. Wild, one-off experiment: to keep the geeks interested. Tried-and-true slam-dunk: to show off your brewing dominance. The first category is exemplified by 21st Amendment, and the ridiculous Watermelon Wheat they show up with year in and year out. Category 2 experimenters include Stone and Widmer, cranking out something special or unusual for the festival each year, which can be hit or miss. For example, I loved Widmer's Imperial Wit last year (many people disagreed), but their sorghum/tapioca beer in 2006 was lame. Finally, a few brewers take the chest-thumping approach, like Russian River, bringing Pliny the Elder every time, which ratebeer says is in the 100th percentile. It's better than 100% of all beers -- it's even better than itself! Because of strategies 1 and 2, not every beer is going to bowl you over. That's OK, because what makes the OBF special is not so much all the different beers, but rather the mellow, friendly vibe. Maybe the beer has something to do with that. The crowd also tends to have more women than you would expect at a beer festival -- I remember being struck by it when I first went in 2003, thinking "Hey, it's not just a bunch of old, fat guys". 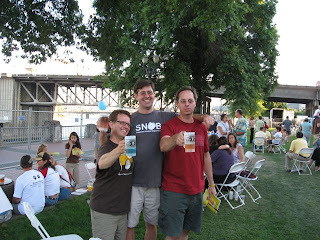 We even bring kids to the festival -- draft root beer is one of the bribes that makes that possible. That pretty much sums it up about the OBF: relaxed atmosphere, lotsa beers. So for the rest of this article, I'd like to give you some ideas for Portland points of interest within walking distance of the festival. After all, you may want to get out of the chain-link fence for a bit, either to pace yourself, or to do some more in-depth beer research. Heading north along the river, accompanied by the automotive roar of I-5 overhead, you'll cross under the Morrison and Burnside Bridges before coming to a stretch of the sidewalk which actually floats in the Willamette. You'll cross the river back to Waterfront Park on the Steel Bridge (1914). There are other double-deck drawbridges in the world, but the Steel Bridge is the only one that telescopes: the lower deck can be raised while the upper deck remains open to traffic. There are several interesting brewpub options you can walk to from the festival. Tugboat Brewing Company [review] is about 1/2 mile west of the festival. Follow Oak St. across Broadway, Tugboat is one block to your right. The Oregon outpost of Rock Bottom is about 1/4 mile southwest of the festival at 2nd and Morrison. If you took the stroll to the east side of the river, you're only about a half-mile from Roots [review] at 7th and Hawthorne, the Lucky Labrador [review] at 9th and Hawthorne, and the Green Dragon [review] at 9th and Yamhill. Horse Brass Pub [review]: a national treasure. That's my take on the Oregon Brewers Festival, and some things to do nearby if you're a tourist. Thanks to Thomas for hosting this Session! I seem to remember you enjoying the sorghum/tapioca beer, at least enough to drink mine for me. That's what a good friend I am -- making sure you didn't have to compromise your principles and pour out a beer. Thanks for the OBF post. It got me looking fwd to my 15th straight OBF (each one where I've been of legal age to enjoy the wares)! I must add a couple walking distance options: across the street from Tugboat - Bailey's Tap Room; 20+ taps of the best local beers around. Almost like a mini OBF every day! And Henry's - the new beer bar/restaurant/meat market on Burnside in the old Henry W's brewery building. A HUGE tap list, and great food for after a long day of OBF, and to refuel for another long day of OBF! See y'all there again in 2008! Hi ASG: Bailey's is a good call, though my eastside bias calls instead for a trip to the Green Dragon. Henry's, I can't recommend. The servers don't know the beer; the beer list is impressive until you order something from it and it's not really pouring (first two tries last visit); and the Wall Street Journal caught them with cheater pints! Plus the ghost of Henry Weinhard rolls in his grave every time you go there :-).